There’s nothing quite as comforting as coming in from the cold to a warming home-made cooked meal. We’ve collected some of our favourite autumn beef recipes from around the Internet that are perfect for Guy Fawkes Night. These meals can be cooked in advance so all you need to do is head out to be wowed by your local firework display and have fun with the family. Simple click on the titles to discover the ingredients and methods involved in each dish. This is an excellent meal for both Halloween and Guy Fawkes Night and indeed any night when you want to focus your attention away from the kitchen. Ask your butcher from 1kg piece of beef brisket for a succulent and delicious dish that will be ready by the time you get home. Our recipe serves up to eight people and cooks slowly using ingredients such as honey and Worcestershire sauce. 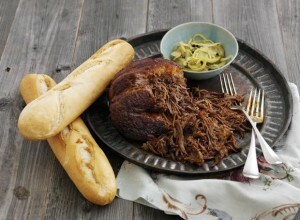 Come home and enjoy the tender pulled beef in warm baguettes or with creamy mash potatoes. Ask your butcher for 3kg of lean brisket for this recipe. Another dish for your slow cooker, a warming stew that delivers a bit of a kick thanks to the chilli and curry powders. Ask your butcher for 1.5lb of Hereford stewing beef to serve a family of four. What’s your favourite beef dish to warm you up during autumn? Come and tell us on the Hereford Beef Facebook page.